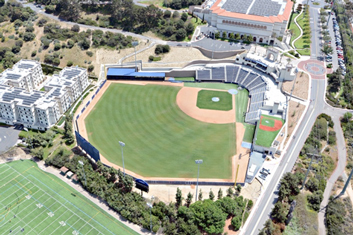 University of San Diego’s Fowler Park is a replacement of the original campus ballpark. The new entrance to the park connects the ballpark to campus buildings and increases available seating with the option of additional seats during NCAA playoff events. The renovation included additional field lighting, a new batter’s eye, upgraded practice tunnels and a new scoreboard with video capability. In order to complete the project in time for the University to begin their baseball season on the new field, the Dynalectric team provided time saving building methods while installing the stadium lighting. This helped recover a schedule that slipped due to civil constraints at the start of the project. The ballpark was ready for the season opener and now has the infrastructure to support nationally televised games. Dynalectric worked with the design team to provide alternate conduit routing that saved time and cost while allowing for future expansion. The Fowler Park was previously known as Cunningham Stadium, named after former coach John Cunningham. The renovations to the ballpark are part of the university’s renovation project to their athletic facilities. The ballpark was renamed after Ron and Lexis Fowler after their donation to fund the renovations.